Hello everyone! 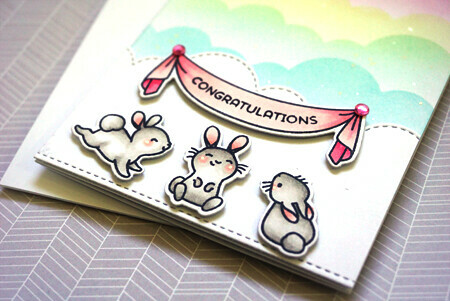 Welcome back to our third day of Stamp Highlights and today, we’re taking a closer look at Hippity Hop. I love the little bunnies and banner so I wanted to focus on those. 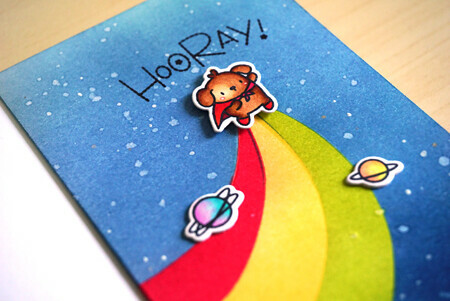 I decided to move my focal point from the middle, to the bottom of the card, leaving the top of the card empty. I coloured my little bunnies with copics (W1, W3, W5) and adhered it to a panel that’s cut using On the Hills creative cuts. I love the little stitching! I used the same die and masked off the top so I could blend my clouds above the panel. Finished with the banner hanging from above and two little droplets on the ends of the banner. Good morning and happy Monday! 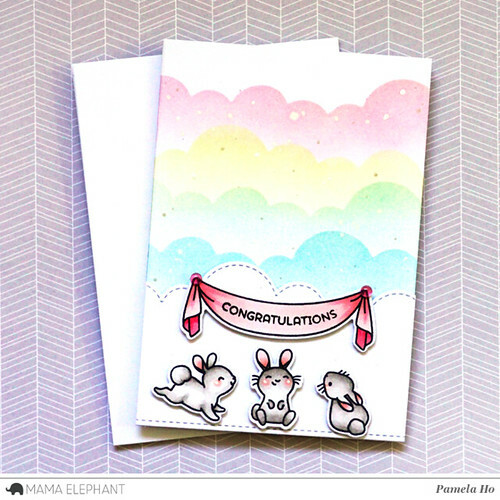 We are at our last stamp highlight for Mama Elephant‘s April release with Little Dog Agenda. 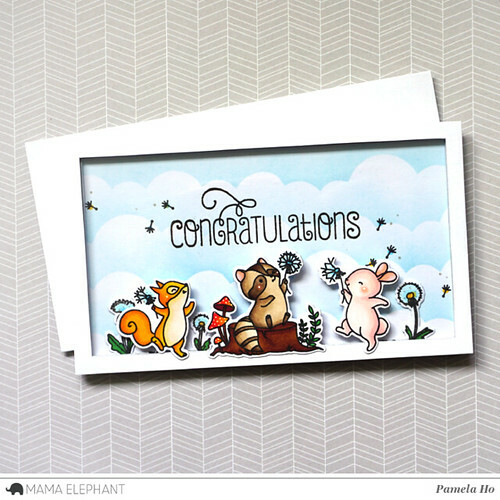 I am soooo happy that Mama Elephant decided to make the Little Dog Agenda creative cuts and Little Cat Agenda creative cuts! This is going to make mass production much easier! I brought the focus to Superdog on my card. It’s Superdog to the rescue! I masked off and blended a rainbow with Superdog flying up into space. I paired it up with the tiny planets from Space Bears. I thought they were just the perfect size for Superdog! I’ve accumulated a huge stack of cards (way more than I can use!) so I thought I’d give out some of my Mama Elephant projects to a lucky reader! Just comment on any of my April project blog posts (excluding the Stampede) and you’ll be entered into a draw for a special package 🙂 You can also let me know in the comments if there are certain cards that you would like! Good morning! 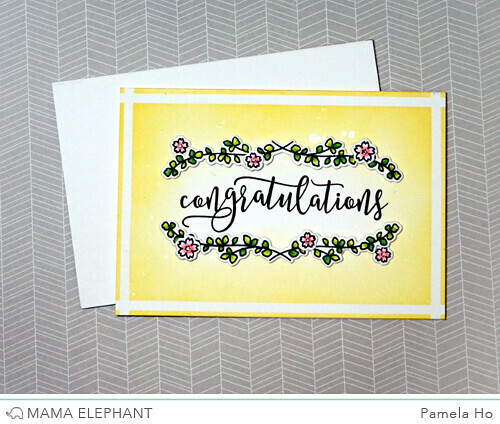 We’re back for our last day for Mama Elephant‘s March release and today, we’re taking a closer look at Congrats All Around. I just love the little frame and the little chick sticking out from behind! I’m back to the tall skinny format card because I just love the amount of vertical space I have to work with! 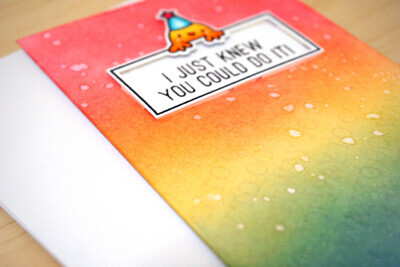 Using only 3 colours, I blended a rainbow and flicked some water and white opaque paint onto the card base. Using the watermark ink (haven’t used that in a long time! 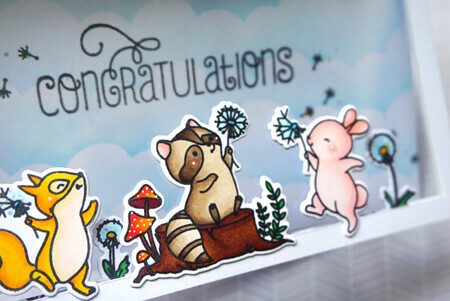 ), I repeated the sentiment “Way to Go!” from the stamp set as the background. 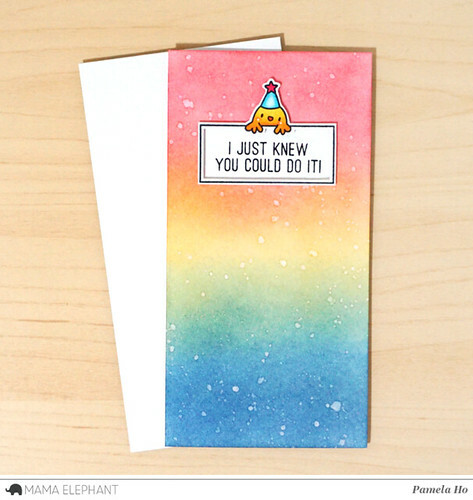 You can see the subtle sentiment stamping here! I adhered the frame using some foam tape to give the card some dimensions. 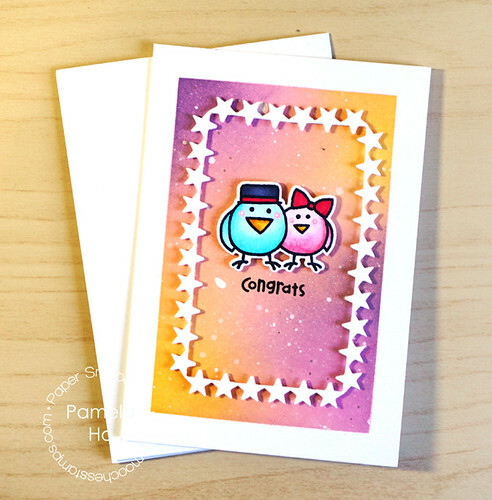 It’s Pep Rally week and we are here today to share a sampling of the NEW Paper Smooches JULY 2016 release with you! ONE new stamp and FIVE new dies will be available to purchase. Once our release goes live, you will find our new products HERE. Deadline: You have until midnight PT on Sunday, August 28 to leave a comment. Please check the Paper Smooches blog on Monday, August 29 to see if you are one of the FOUR lucky winners. I’m using the star frame from the Super Stars dies. I just love all these different stars in this die set! I masked off my background and blended a light and fluffy background using pink, purple and yellow inks. I stamped the birdies from Featheredd Friends and adhered them in the middle finished off with a simple sentiment. Welcome back everyone! We’re taking a close look at Calli Letters. This stamp set is AMAZING! I love how Kryssi/Angela included different ways of writing the same letter, and the double “t” and “s” to help make the letter-building easier! 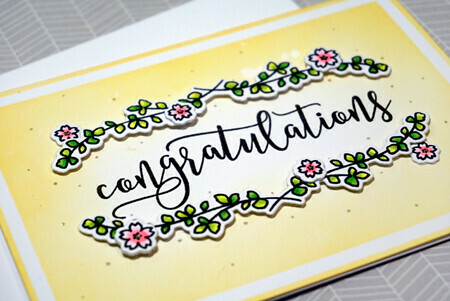 Using the letters one by one, I built my sentiment “congratulations”. The connecting of each letter was very easy and it didn’t take too much measuring to align each letter. The beauty of script letters is that you don’t need to line them up straight! I finished the card off by decorating it with the leafy border from New Family and flowers from Lunar Extras. 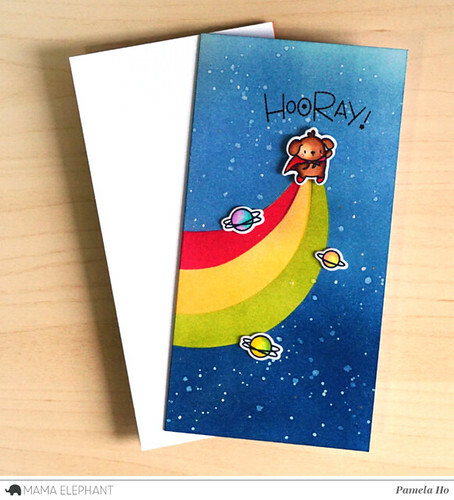 This is a perfect card for a new baby or wedding! Thank you so much for sticking around these 4 days! 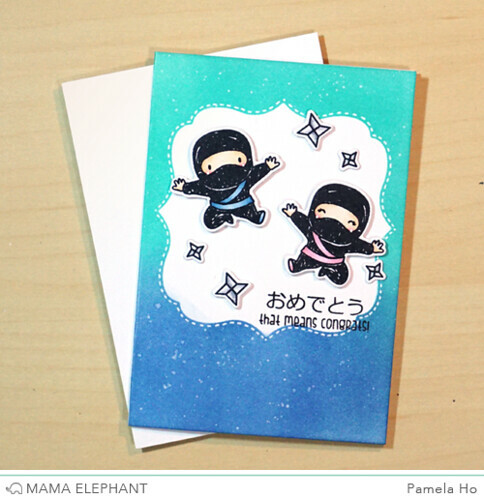 I’ll be back with another project for Mama Elephant’s May release later!